When learning swing-dancing aerials, there aren’t many “practice” moves that can make the transition from the basic step to the flipping-over-your-partner’s-head step easier. 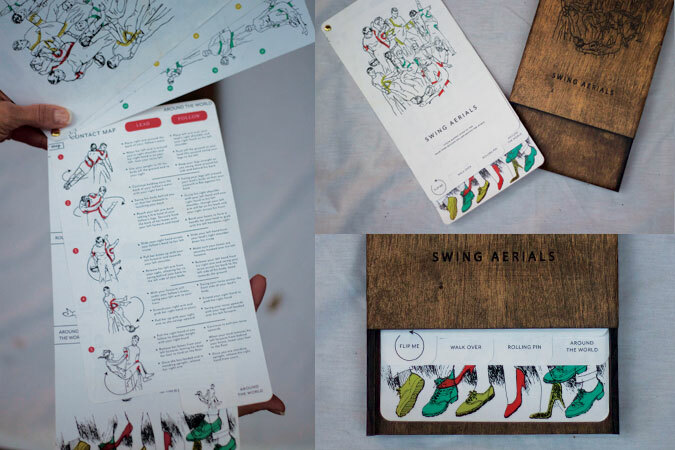 This booklet solves that problem by breaking down three swing aerials into image stills with corresponding instructions for the lead and follow as they attempt the move. The color maps out the areas of body contact between the dancers, showing exactly what positions, lifts, and directions are involved in completing each move.